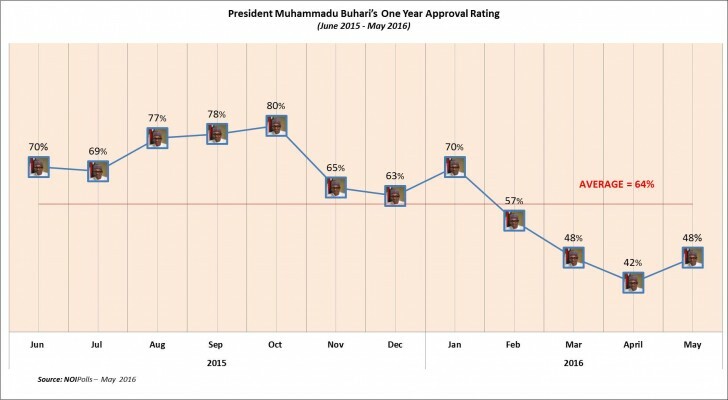 The public opinion poll conducted by NOIPolls Limited in a series of monthly presidential approval ratings to appraise the job performance of President Muhammadu Buhari since assuming office on May 29, 2015, has revealed that the president got an average job approval rating of 64 per cent. However, Buhari was rated very low on job creation at 14 per cent, and handling of the economy at 21 per cent. The rating came as the president monday approved the formation of a presidential commission on the ease of doing business in Nigeria. 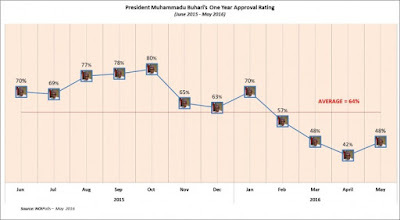 In the report released yesterday, NOIPolls said Buhari had the highest rating of 80 per cent in October 2015, and lowest rating of 42 per cent in April 2016. 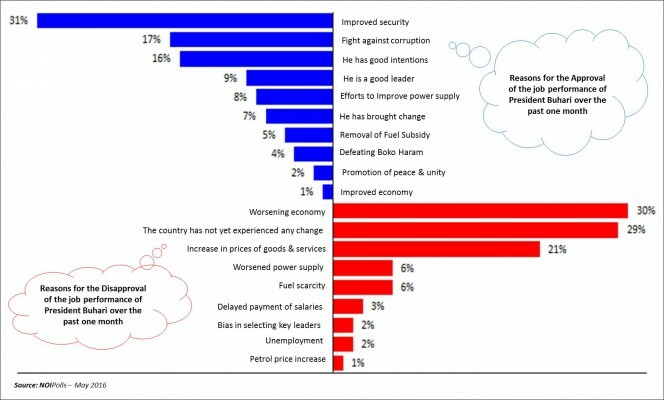 “Interestingly, compared to one year ago, 44 per cent of Nigerians believe the country is currently moving in the right direction, while 37 per cent believe it’s moving in the wrong direction, leaving only 19 per cent who believe the country is neither moving in the right nor wrong direction,” NOIPolls said in its report released monday. According to the poll, when asked of the most important issue Buhari’s administration should focus its attention on in the remaining three years of his tenure, Nigerians were said to have identified unemployment, 21 per cent; power, 17 per cent; and the economy, 16 per cent as the top priority areas. 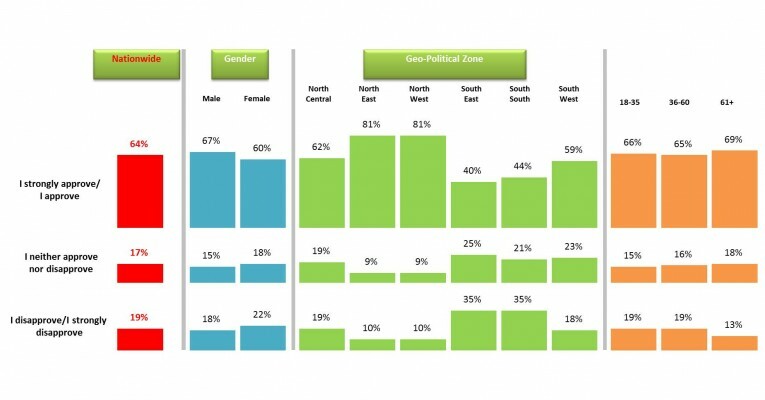 The group said further analysis of the president’s approval rating based on geo-political zones indicated that the North-west and North-east geopolitical zones with 81 per cent each, had the highest proportion of respondents who approved of the president’s job performance, while the South-south and South-east zones with 35 per cent each accounted for the highest proportion of respondents who disapproved of the president’s performance. The organisation added: “Interestingly, the average approval of 64 per cent cuts across all age groups, although it appears more male than female respondents, 67 per cent versus 60 per cent seemed to approve of his performance. NOIPolls prides itself as the number one country specific polling services in West Africa, conducting periodic opinion polls and studies on various socio-economic and political issues in Nigeria.